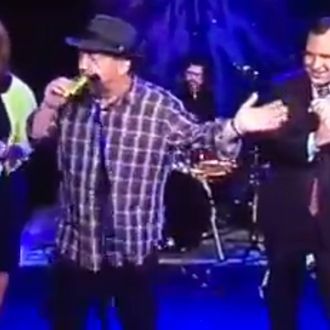 The hilarious JD and the Straight Shot media tour rolls on, and a day after Jim Dolan treated Fox 5 viewers to a rockin’ kazoo solo on live television, the New York Post reports that Dolan will attempt to set a world record for kazoo playing at a concert on Thursday night. And he needs your help! When Dolan’s band opens again for the Eagles on Thursday, audience members will be given a kazoo upon entering the Garden. If 6,000 people join in on the instrument during his solo on the song “Governor’s Blues,” Dolan will donate $100,000 to the ALS Association. Among those joining Dolan onstage will be Amar’e Stoudemire, Carmelo Anthony, Henrik Lundqvist, and John McEnroe. The record attempt will take place at 7:15 p.m. on Thursday. It’ll look like this, but 6,000 times louder, and infinitely more ridiculous.